and we lived in a silver-golden-bronze-copper- every rich metal you could imagine. beautiful destiny. I wanted to be one of them. But I was not but a mere mortal 4 year old colt. even older than Arim. She was a mare that would seem witchy, because she did live in a small hut, had a big pot full of green potions, and spoke like one, but she was actually a good reinforcement. Her potions could do many things in battles. a soothing voice of the lead mare, Sahrah. It wasn't pronounced Sarah, but Sigh-ra. unicorn inside the palace at that minute, doing their daily duties. She treated the foals like a protective grandmother, and she treated the younger unicorns, about my age, about the same, only there was more teasing and wicked jokes rather than playing and tickling. I followed after her as she went inside. Picky, picky, picky. I LOVED it! 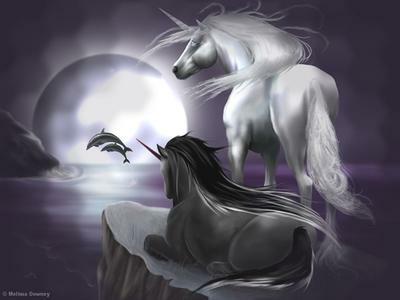 I've loved unicorns since I was 6 years old and still love them. I would really enjoy a part 2 as I just discovered this site. I think it's good. I know how hard it is to right sometimes and I liked it. I think you should feel proud. Don't be discouraged if one person doesn't like it, everyone has there own taste. I have written stories on here and haven't gotten comments but I keep writing because I like to and I think there good even if there not. Alright then, no part two. You can just forget this story forever. I tried my hardest on it. And don't expect any more stories from me. Why is no one commenting? I would really like for someone to comment on my story.. its been up forever!